Never let it be said that Queen Victoria didn’t appreciate the efforts being made to fight for Queen and Country–after all, we’ve got the chocolate to prove it. 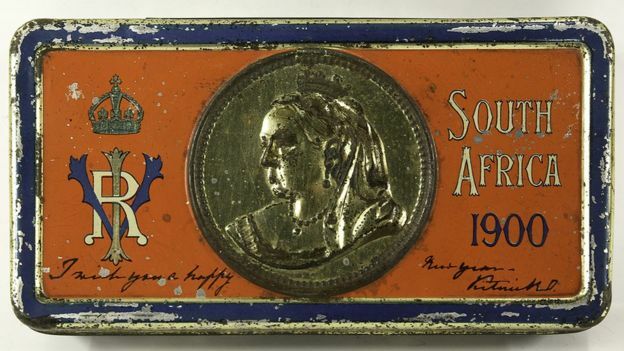 A tin of chocolate has come to light that was one of a batch sent to the soldiers fighting the Boer War in South Africa at the beginning of 1900. 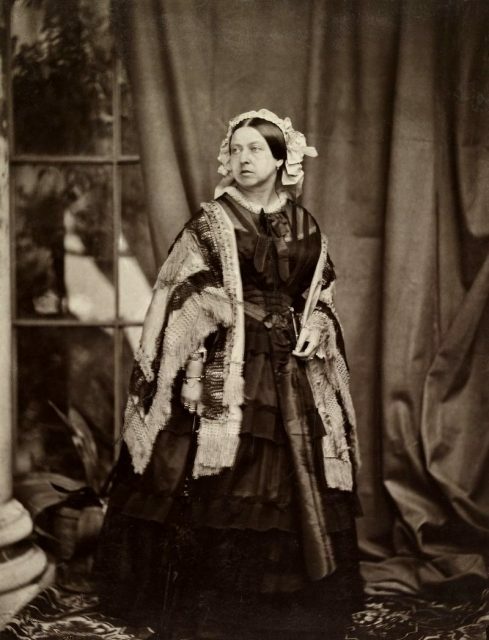 The chocolates were paid for by Queen Victoria and reportedly, some 100,000 tins were sent. 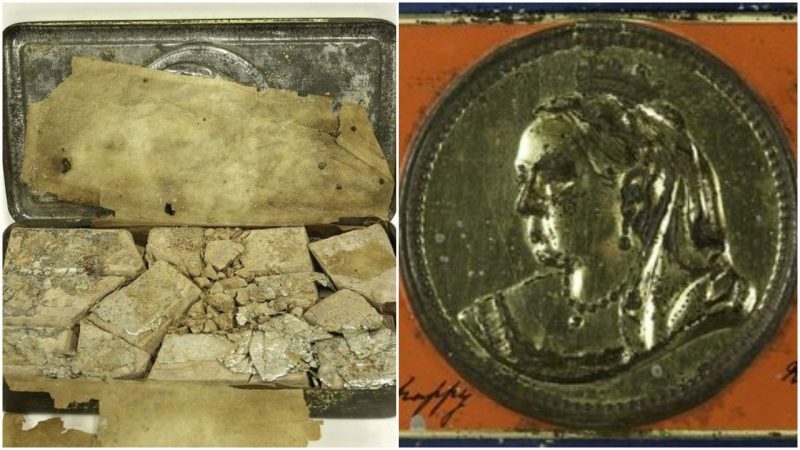 The owner of the tin of uneaten 118-year-old chocolate came forward after learning of a news story about chocolate dating to World War One being auctioned. “After reading about that, a pensioner in London contacted us to say she had even older chocolate,” auctioneer Paul Cooper told the BBC. The woman had kept unsold souvenirs and collectibles when her shop closed 25 years ago. “She dug into a cupboard and found the Boer War tin–with the chocolate still inside,” Cooper said. There is still a trace of chocolate aroma to the tin today, although experts say don’t even think about eating it. Along with the chocolate, the tin sill has some of the foil, though it has deteriorated, and the original paper covering. 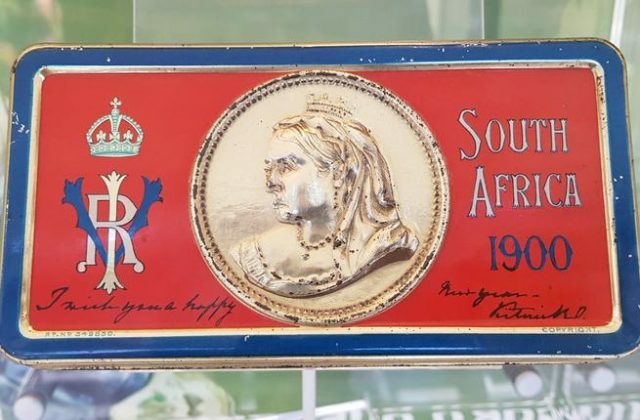 The box, which measures 6 inches by 3.5 inches, is painted red, gold, and blue and has an embossed picture of the Queen with her Royal cypher on the left and “South Africa 1900” on the right. 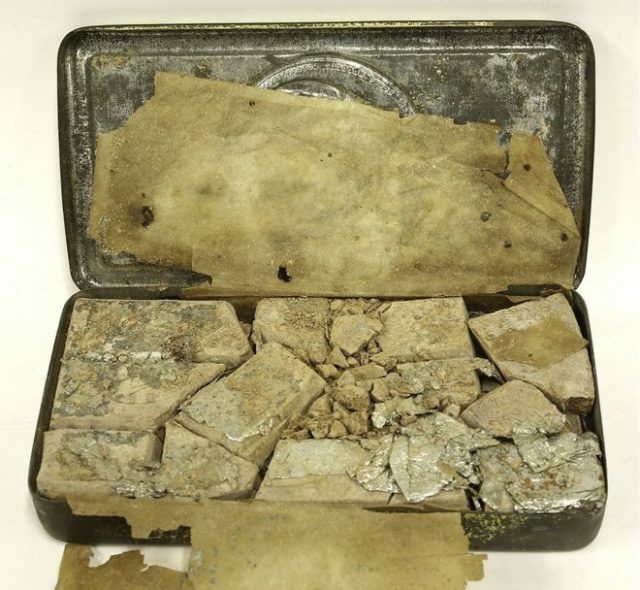 As to why the chocolate was not eaten at the time, speculation is that it was considered so special that the soldier who received it sent it back to his family members to keep it–and they did. Chocolate was a luxury for many English households at the turn of the century. There is some controversy attached to the chocolate gifts. 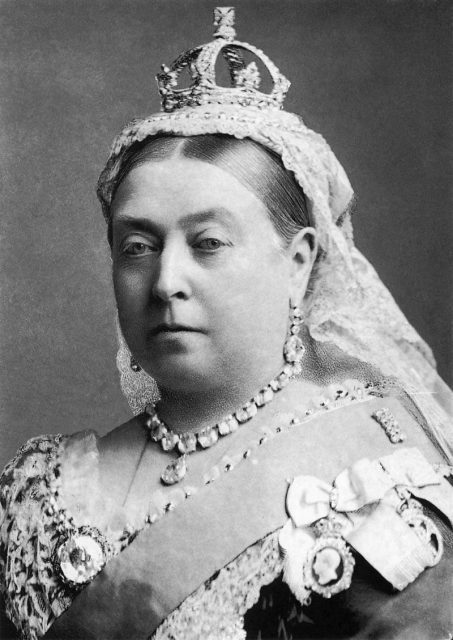 Queen Victoria paid for the chocolates to be sent to soldiers. However, at the time chocolate makers Cadbury, Fry and Rowntree were pacifist Quakers and so opposed the war. The company didn’t want to be seen to profit from the conflict. To hide their involvement, they donated the chocolate for free, in unbranded tins. But the Queen was not amused. She wanted the troops to know that what they were getting was British chocolate. The company then complied with what the Queen wanted. Reportedly, French cartoonists mocked the royal gift of chocolates at the time. However, she definitely wasn’t the only person to do it. The United States government sent tons of chocolate to soldiers fighting in the Spanish-American War in the Philippines in 1898. The book Chocolate As Medicine relates that Admiral George Dewey, known as the “Hero of Manila,” was featured on the label of novelty chocolate cigars made by the Hershey Chocolate Company in Pennsylvania. Nancy Bilyeau, a former staff editor at *Entertainment Weekly, Rolling Stone*, and *InStyle*, has written a trilogy of historical thrillers for Touchstone Books. For more information, go to www.nancybilyeau.com.